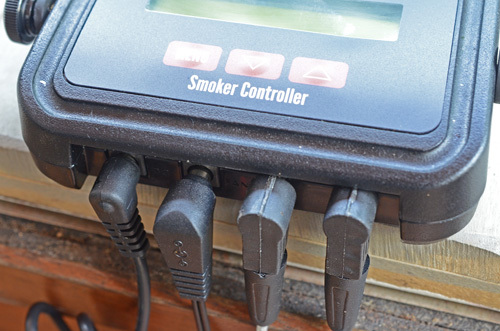 Electric controllers for BBQ smokers have been around for quite a while now. I can remember when they were a pretty brand new thing. 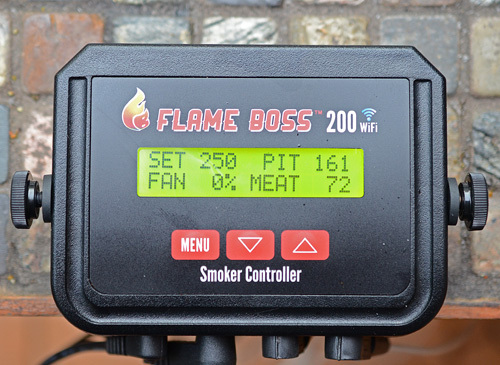 I received a Flame Boss 200 electronic smoker controller to review and for the past two months, I have been putting it through its paces at the NMT Proving Grounds (aka my back deck). 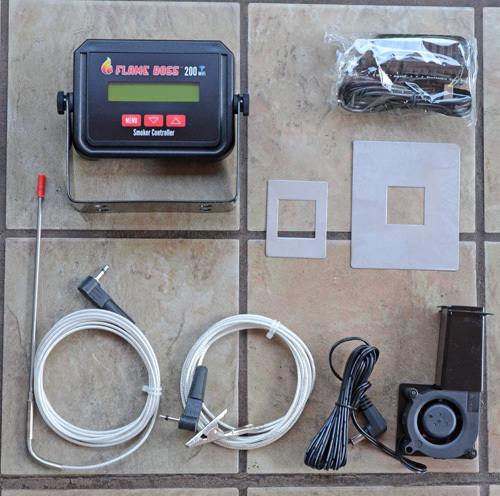 I am impressed with the features, performance, and functionality of the Flame Boss 200 system. For folks not familiar with them, electronic controllers are devices that keep an eye on your smoker and maintains a cooking temperature. 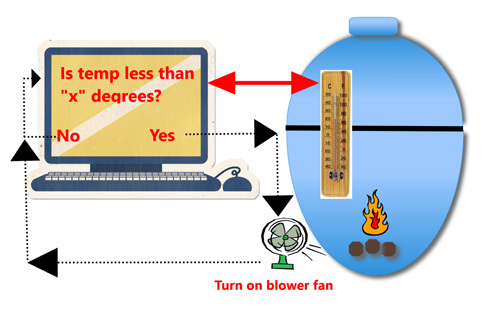 In an overly simplified explanation, a processor keeps checking the temperature probe inside your grill and if that is below the goal or "set" temperature that you wanted, it kicks on a fan to stoke the fire and bring up the heat. What really goes on in the processor (really a PID controller) is much more advanced than a simple if-then feedback loop. It's constantly measuring data. It's calculating deviation, rates of change, and making predictions about grill behavior and then adjusting how it controls the blower. Now before you run off thinking all you have to do is buy one of these and you'll be an instant pitmaster, it's not that easy. My advice to everyone is that you should have at least six months of experience with frequent cooks using the manual controls of your cooker before you begin using an electronic controller. You need to have an intimate understanding of fire management and how your smoker acts/reacts. An electronic controller won't turn a bad pit monkey into a talented pitmaster, it's not a magic bullet. Clockwise from upper left: PID controller with mounting bracket, power adapter, 2 blower adapters, blower, cooking temp probe, and meat temp probe. This is the heart of the system and does all of the thinking. I like the design, it reminds me of electronics for boats. The housing is plastic and the faceplate has blister style buttons, which make it a little more splash resistance (that's my opinion, not their claim). User Friendly - The display and controls are simple, intuitive, and put everything you need at the touch of a finger tip. Backlit LCD display is easy to read day or night. It has the key information displayed at a glance - your target temp, current temp, fan status as a percentage, and meat temp. 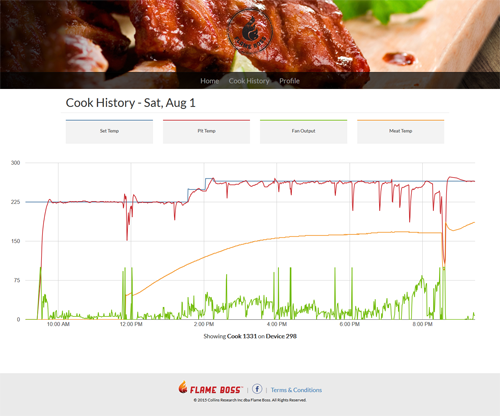 It has alerts for when you hit your target meat temperature or cook timer. You can even have them come to your smart phone. Mounting Bracket - The device comes with a mounting bracket so you can permanently install to your table or a base or you can skip the bracket and lay it flat. I totally would not even mention that except I saw that another controller manufacturer charges $20 for a bracket. Keep Warm - You can set the Flame Boss 200 so that when your meat hits the target internal temperature, the controller will drop the pit temp to whatever pit temp you want to just keep the meat warm. This keeps you from overcooking your meat because sometimes butts and briskets cook faster than others. 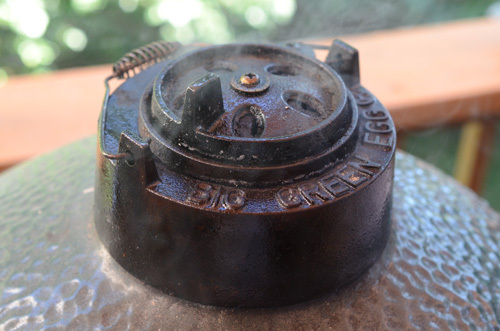 Open Pit Detection - With my Auber Instruments controller, when I open my kamado, the controller sees the temperature drop and kicks on the fan while the lid is open and stokes the fire trying desperately to raise the temperature. Then when the lid closes, I have too hot of a fire. I learned to unplug the fan before opening the smoker because of this. The Flame Boss 200 is smarter than that. It detects the temp drop, realizes the pit is open and starts an adjustable timed delay where it does nothing. Once your lid is closed, it will kick back on and run the fan as needed to restore the normal temps. Power Glitch protection - If your electrical power kicks off and back on, the Flame Boss recalls the last settings instead of defaulting to factory settings so it won't mess up your cook. 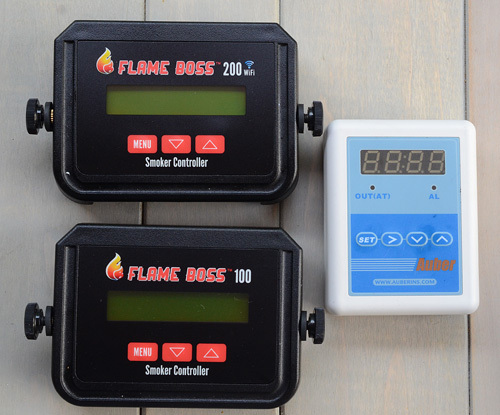 Flame Boss 200 and Flame Boss 100 shown next to an Auber Instruments controller. It's important to keep the top vent almost all of the way closed when using a controller at low and slow temps. The temperature probe wires for the meat and pit are often a critical failure point in remote probe thermometers and controllers. My sister and I experienced this when the probe wires for a controller we were using died in the middle of the night when cooking for 80 people. The Flame Boss uses ruggedized probes and cables to make their system more robust than others. PTFE coating (aka teflon) of the cables keeps them from getting wet and add physical protection. This coating also makes it easy to wipe the wires clean. 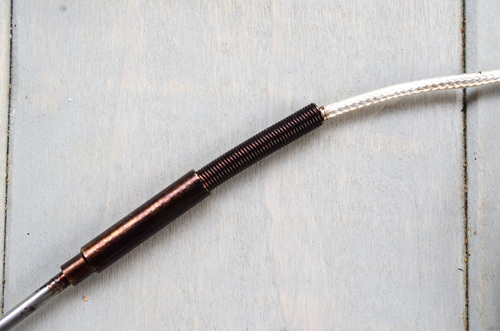 The Flame Boss uses RTD temperature sensors which are more expensive than thermocouples but they are more accurate, stable, and have a more robust signal. Cable Management helps keep things orderly and avoids damage to cords. 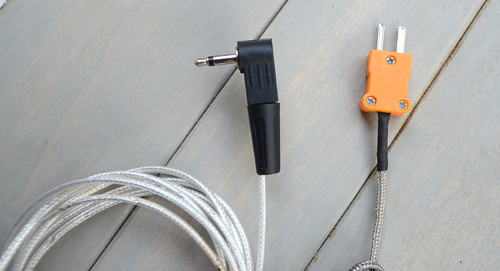 The Flame Boss uses right angle 3.5mm jacks for connecting wires to the processor, which has a recessed protected lip where the cables connect. That's a small detail but I appreciate it. Six feet long - some controllers start at 4' cables and offer longer ones as an upgrade. Believe me, you'll want the 6 feet long cables. Flame Boss cable on left, Auber Instruments on right. The flame boss cable is PTFE coated and is at a right angle so it doesn't stick straight out from the processor. When things stick straight out of a device, they are easier to break (USB cables anyone?) and it puts extra tension on the cable because it has to bend. Nice cable management keeps wires out of your way and keeps the wires safe. More cable protection where the cable enters the meat probe. The blower for the Flame Boss is powered by the same Delta brushless 6.5 cfm fan that Auber Instruments use. 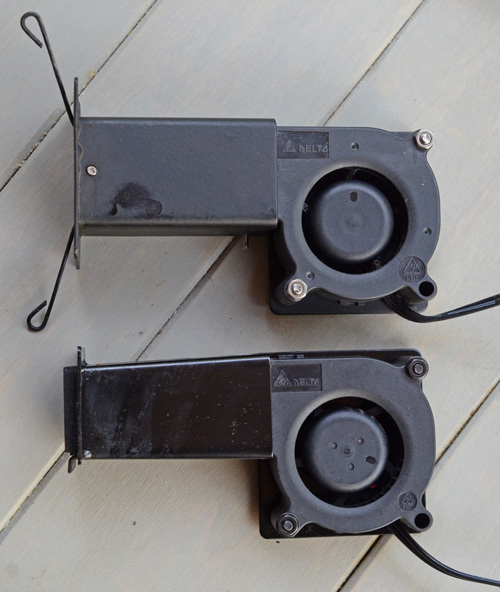 It is a variable speed fan so it lets the controller tailor the amount of air blowing into your smoker. The status of the fan is on the home screen and listed as a percentage. I have found it to be more than adequate and I have rarely seen it run at 100% except for start ups. It is super easy to install on a kamado grill. Auber Instruments on top uses a spring loaded connection. The Flame Boss on bottom simply utilizes gravity to hold in place. Springs wear out, gravity doesn't. 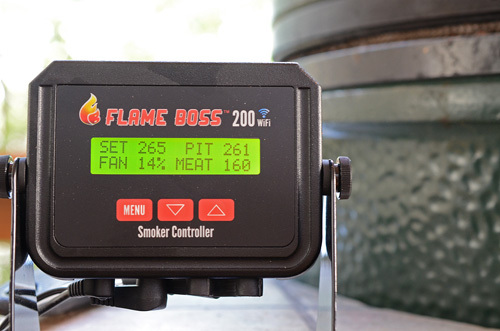 Flame Boss 200 fits on a variety of kamado grills, Weber Smoky Mountain smokers, and many other cookers. 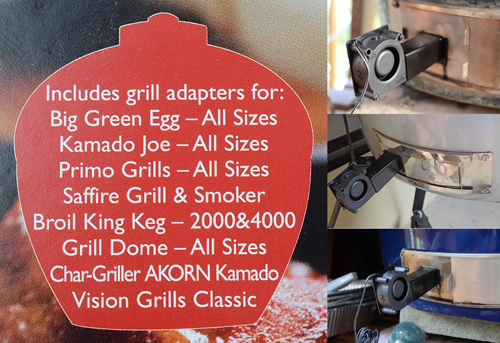 Here it is shown mounted on the different vents of 3 of our kamado grills. Easily my favorite feature! 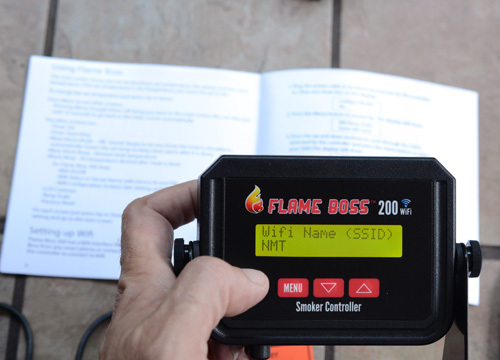 The Flame Boss 200 connects through your home WiFi to access a web based application. It's a super easy set up, all you do is enter your network name and password. No installing software, no fiddling with laptop settings or ports. You can even use a hot spot connection at a remote location, ideal for BBQ contests. The Dashboard works the same on your phone, tablet, or computer, no different versions to contend with. It's so freaking awesome on overnight cooks to be able to check my temps and even adjust them without even getting out of bed! The set up was very easy and worked on the first try. Screenshot of the Dashboard from my laptop. This was a saved cook, otherwise, the 4 tiles at the top would disply set temp, pit temp, fan output, and current meat temp. The drops in the red line (cooking temp) are from me opening the lid a lot for spritzing, taking pictures, etc. Screenshot from my mobile phone during a cook. The 4 tiles give you at a glance information while the detailed graph would be scrolled down below. 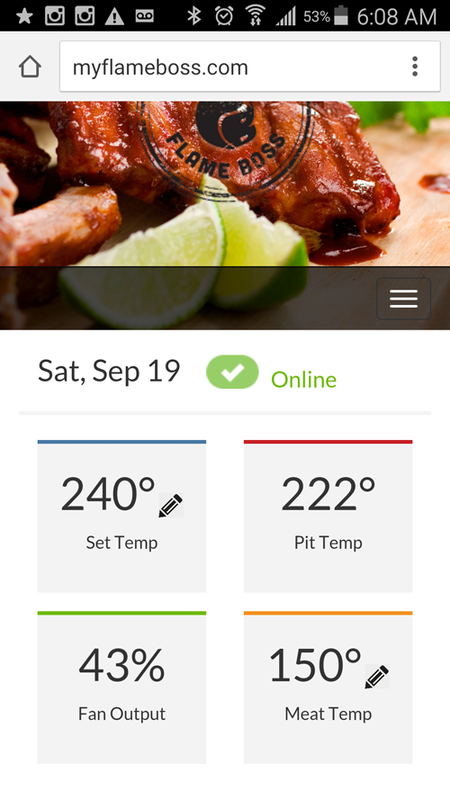 You can change the cooking and internal meat temps right from your phone. Flame Boss offers a satisfaction guaranteed, 30 day return policy. When you are spending hundreds of dollars you would expect that, right? As Lee Corso would say, not so fast! One leading controller company won't accept returns if the controller has been used at all. Another one will only accept it if it is in "resellable condition". Flame Boss backs their product with a full 1 year warranty compared to 90 and 180 days from other controller makers. This is a short list because there are so many bells and whistles built into the Flame Boss. High/low cook temp alarms - while the controller keeps the temps steady so there shouldn't be high or low cook temps, there are things outside of the Flame Boss' control, like running out of coal or someone leaving the top vent open. Good news is this feature is coming in an upcoming firmware update. Deadman Alert - I haven't seen any controller with this yet. Premium ones like Flame Boss remember the settings once the power comes back on. But what if you are asleep and the power goes out for longer? The fire could die by the time power is back on. It would be cool to have an alert from the Dashboard that it lost the controller connection for more than "x" length of time. Edit capability to add information with the historical graphs. It would be nice to have a field to add ad hoc information to be saved, such as meat (weight, source), prep (injections, rubs used, trimming), and other cook details. 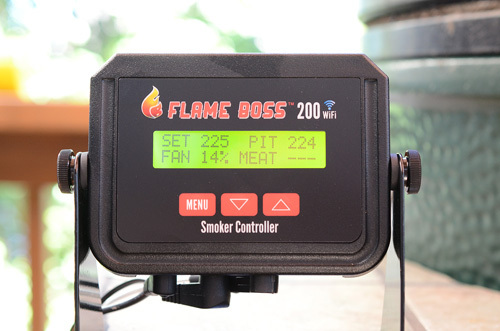 The Flame Boss 200 is a top of the line electric controller for your kamado smoker/grill. It is packed with features, performs well, and I have no problem giving it a "highly recommended" rating. If you don't want or need the Wifi capability (you do, you really do), you can get the Flame Boss 100 for $60 less and still get all of the other great features. [Standard FTC Disclaimer] I got the review sample for free but I put my money where my mouth is and just bought another Flame Boss 200 at full price for our BBQ team.